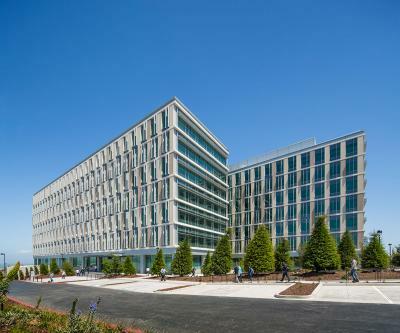 Biotech company Genentech had ambitious energy efficiency and employee-comfort goals for its new 255,000-square-foot building in South San Francisco. As they developed a new building design, they sought help in optimizing a lighting/shading/workstation solution. FLEXLAB® provided a world-class facility for testing and optimizing integrated building systems under real-world conditions and maintaining the high performance of the building once it is occupied. FLEXLAB takes the guesswork out of creating a comfortable work environment in an energy-efficient building and provides other benefits, as well. The FLEXLAB experiment showed Genentech how to reduce energy use for lighting by 60 percent in open-plan office areas. That’s energy savings of 60 percent on a baseline that already included daylight dimming. Webcor Builders constructed and equipped a section of Genentech’s new building on FLEXLAB’s large-scale rotating test bed, including furniture, façade systems, flooring, lighting and ceiling systems. 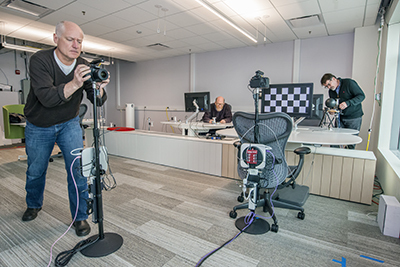 With decisions on lighting and shading systems to be made, Berkeley Lab researchers ran comparison tests in FLEXLAB on different options, rotating the test bed each week to test solutions for three different building orientations. Each series of tests examined outside fixed shades, internal automated shades and dimmable lighting systems to test how sunlight from different solar orientations would affect interior daylight, room temperature, visual comfort and energy use. An array of high-accuracy sensors continuously captured quantitative performance data as well as high-dynamic range photographs from which occupant visual comfort was assessed. Initial design solutions were refined in three successive stages over a four-month period. Between tests, FLEXLAB researchers analyzed the data, and suggested refinements to the systems for the next test series. The Genentech design staff spent several days “working” in the FLEXLAB test bed to confirm first-hand the final technology selections and design solutions. Once Genentech decided which lighting and shading systems it wanted to use, operations, maintenance and commissioning staff took them for a test drive in FLEXLAB before final installation in the building. "FLEXLAB® represents a handshake between science and architecture."